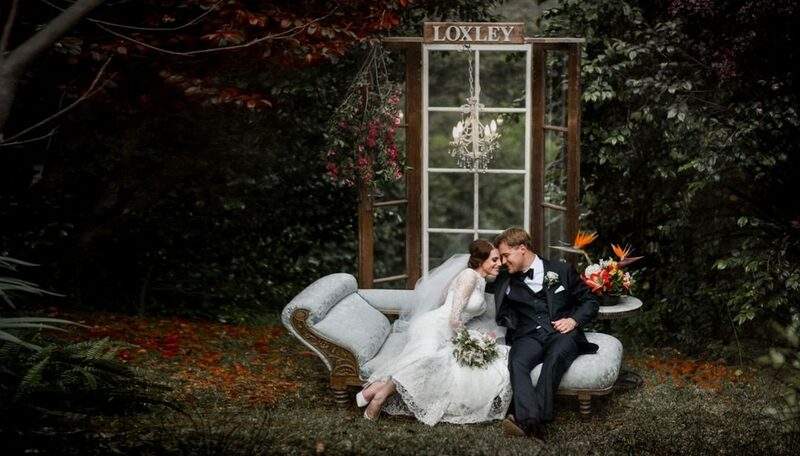 For the perfect bridal paradise you will fall in love with a The Perfect Blue Mountains Wedding at Loxley on Bellbird. Elegant Loxley is situated in the magnificent Hawkesbury Valley. This picturesque venue boasts exceptional Romantic chalets for two, inspiring garden rooms, expansive emerald gardens, a 19th century private dining room, a sparkling pool, the Kauri wedding reception room, and the extraordinary Peppercorn Lodge, which sleeps 18 people. The spacious Lodge features 9 bedrooms and 8 bathrooms, with a panoramic view of the Sydney Basin and beyond. Every morning, guests of the Peppercorn Lodge can savor a hearty and delicious country breakfast in the Kauri room. The reception room boasts classic timber-wood floors, hardwood cathedral ceilings, a sandstone fireplace, and polished white French doors. This matrimonial nirvana overlooks a valley replete with abundant green fields and magnificent rain-forest foliage. For 2017, Loxley on Bellbird Hill is offering exceptional platinum, gold, silver, and mid-week bridal packages. The bridal suite is offered at a discounted rate for the gold, silver, and mid-week bridal packages. Wedding couples who choose the Platinum wedding package, however, will enjoy a complimentary bridal suite replete with the traditional fresh flowers, delicious chocolates, and sparkling wine. All packages come with delectable hors d’oeuvres, entrees, and desserts. For example, the Platinum package boasts a mouthwatering selection of fresh Sydney rock oysters, succulent grilled wagyu beef ribs, and fragrant, oven-baked loin of lamb. Meanwhile, Gold package guests can indulge in King prawn and avocado tian lime crème fraiche; aromatic, marinated pork fillets; and juicy, grilled king-fish. Wedding couples who choose the Silver package will enjoy tender-roasted chicken, seared salmon fillets, and barbecued lamb tenderloins. For entertainment, the Lily Road Band is an amazing choice for all Loxley wedding parties. It has a reputation for being one of the best wedding bands in the region. Lily Road’s gifted wedding singers are seasoned performers who enjoy providing unparalleled wedding entertainment to guests of all ages. The band may be based in Sydney and Melbourne, but it has played to great fanfare all over Australia. Every wedding singer is an accomplished artist who can perform a repertoire of songs for weddings from every era and every musical genre. For example, couples can choose from hip hop, rock, pop, and jazz repertoires. Lily Road Band wedding singers are extremely well-versed in dance music from the 60s to the present era. Lily Road has a song for every stage of the wedding ceremony: the walk down the aisle, the processional, the signing of the register, and the reception. You may hear everything from the modern A Thousand Years by Christina Perri to 80s favorites such as Time After Time by Cyndi Lauper during these solemnly joyful moments. • Silver Package, which includes dinner music, a first dance song, and party dance music. Entertainment will be provided by a 3 piece band of your choice. • Gold Package, which provides wedding ceremony music, dinner music, a first dance, and dance music. All tunes will be performed by a 4 piece band of your choice. • Platinum Package, which includes wedding ceremony music, canapes/hors d’œuvre music, dinner music, a first dance, and dance music. Entertainment will be provided by a 5 piece band of your choice. For this package, dinner music will be performed by a male wedding singer and female wedding singer. The singers will be accompanied by musicians on guitars, bass guitars, keyboard, and drums. Couples can choose from band singers and musicians who perform on a variety of instruments such as saxophones, trombones, trumpets, electric guitars, and acoustic guitars. For couples who are planning smaller weddings, Lily Road has many experienced solo singers who can inspire even the most jaded guest to take to the dance floor. Those who plan on celebrating their wedding nuptials at Loxley should contact Lily Road musicians from the Melbourne wedding band or Sydney wedding band. With an exceptional venue and fantastic wedding music, every couple can enjoy an unforgettable wedding in the Blues Mountains.